Q. What is Makara Jyothi? Commonly people think of it as a star and it is celebrated in Sabarimala as Makara Vilakku. This very word Makara Jyothi has 2 words – Makara and Jyothi. What is Makara? In the sky, we have 12 Rasis or Zodiac signs or constellations. The Sun is in one rasi for a month and transits through to the next rasi in the next month and so in. Like this, the sun covers all the 12 Rasis in a year. As per the Indian calendar, the Sun moves into the Makara Rasi on January14th or 15th. This movement of the Sun into the Makara Rasi is called as Makara Sankranti. This event is part of the annual celestial calendar. Q. If the sun is moving every month into the next Rasi, what is so special the Sun moving into the Makara Rasi? 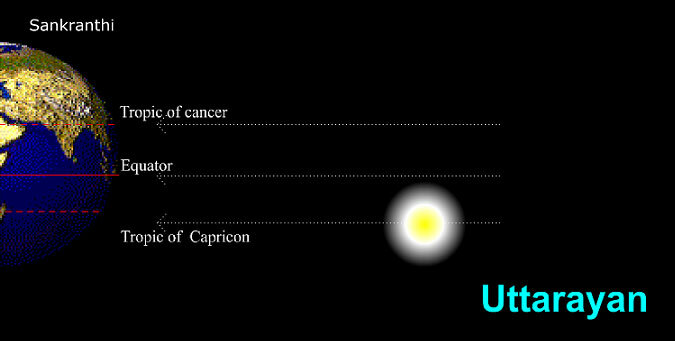 The sun is constantly moving between the Tropic of Cancer and Tropic of Capricorn which is called in the Indian context as Uttarayanam and Dakshinayanam. Makara Sankranti falls in the period when the Sun, which is in the Tropic of Capricorn in the Southern Hemisphere, has started moving northwards towards us in India. Which means we start having longer days. We are starting to come out of the cold season to the warmth and it is this Change, a new beginning of the seasonal cycle that we celebrate. Q. The other word – Jyothi. What is the significance of the Jyothi with Ayyappa who is prayed to as Makara Jyothi? As we have seen here, when the sun is in Southern Hemisphere, we are in the darker period.In the darkness, it is the Jyothi that lights us all up. Ayyappa, as the name suggests, is the embodiment of 5 pre -mordial elements. They were – Akasha (Space), Vayu (Air), Agni (Fire), Apah (Water) and Prithvi (Earth). That one visible to us is Jyothi – Tejas (fire or light). In the long dark nights what stands out is Jyothi or light. It is but appropriate that, during these long dark nights, when we celebrate a fresh breath of life, we celebrate it with light or Jyothi. Ayyappa is also known as an embodiment of Dharma. Dharma is not just a noble deed but means the very characteristic of Nature itself. This celebration of Makara Sankranti every year, brings to our focus, our understanding of the annual turning of the Sun, of the changes taking place in Nature and new hope of life. The very name Ayyappa in the South Indian languages, denotes the embodiment of 5, the 5 Primordial elements of which this Universe or Prapancha is made of. Celebrating the festival of this Makara Sankranti in association with Ayyappa brings to our attention that we and everything in this Prapancham is made up of Panchabhuta – the Primordial 5 elements. So when we say, Ayyappa Saranam, we pay obeisance to these 5 Primordial elements themselves. We pay obeisance to Ayyappa, son of Shiva the cause for the manifestation of matter and Vishnu, the all-pervading force which together keeps this Universe conforming to the Dharma of the Universe and Nature.